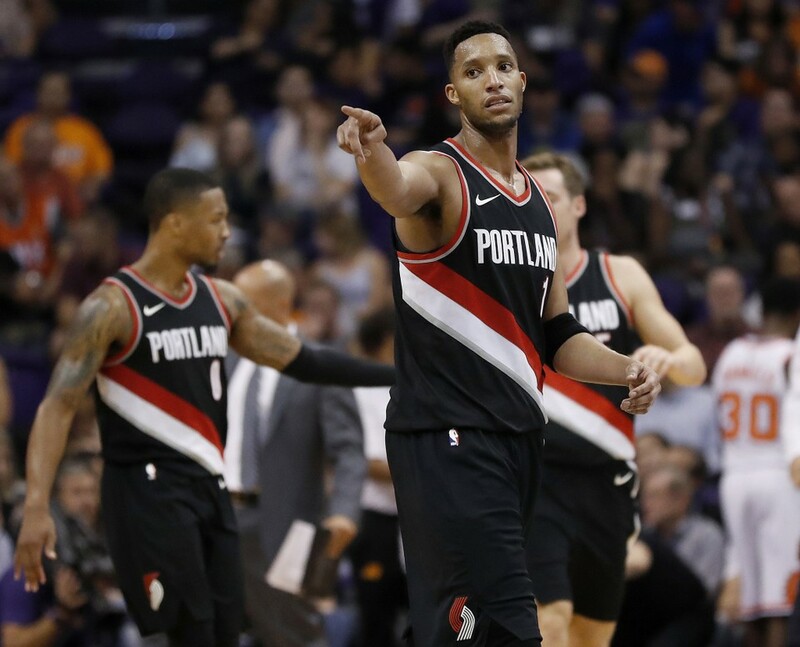 Damian Lillard scored 27 points and the Portland Trail Blazers opened the season by handing the Phoenix Suns the most one-sided loss in the franchise's 49-year history, 124-76 on Wednesday night. Pat Connaughton added a career-high 24 points, making 4 of 6 3-pointers. The Trail Blazers outshot, outrebounded and outhustled the Suns from the opening tip. The 48-point rout exceeded Phoenix's previous record, a 44-point loss to Seattle (151-107) on April 2, 1988. The Blazers dominated even though they were without one of their best players, guard C.J. McCollum, who was suspended one game for leaving the bench area during a tussle involving Phoenix's Alex Len and Caleb Swanigan in a preseason game a week ago. The Suns shot 31.5 percent to Portland's 49 percent, made 7 of 27 3-pointers to the Blazers' 14 of 24 and were outrebounded 57-33. Phoenix had the league's second-worst record last season at 24-58 and looked at least that bad throughout the opener. Eric Bledsoe scored 15 points on 5-of-18 shooting. Devin Booker added 12 on 6-of-17 shooting. Bledsoe was 1 for 6 on 3s, Booker 0 for 3. Portland's bench outscored Phoenix's 61-26. After Booker's 13-footer tied it at 17, Lillard sank a layup and the Blazers bolted away from there. Bledsoe's three-point play cut the lead to 45-35 with 4:38 left in the third quarter, but Portland scored the final 15 points of the half and was up 60-35 at the break. The Suns shot 29 percent in the first half (14 for 49) to Portland's 44 percent (22 for 50). Phoenix was 1 for 11 from 3-point range in the first two quarters to the Blazers' 7 of 13. Most tellingly, the Portland bench outscored its Phoenix counterparts 24-0. Trail Blazers: The one-game suspension, for taking a few steps off the bench in a preseason game, cost McCollum $165,000. .... Connaughton, a fourth-round draft pick of the Baltimore Orioles, had a previous career high of 15 points. ... Portland had six players in double figures. ... Blazers have won four consecutive season openers. ... Trail Blazers don't play their home opener until next Tuesday against New Orleans. Suns: Len sat out the game with a sprained left ankle. He was injured in Saturday's practice. ... Rookie Josh Jackson started and made a 3-pointer with his first shot, but was 2 for 8 the rest of the way with only two rebounds. ... Marquese Chriss made 1 of 5 shots and had one rebound and five fouls in 12:05 minutes.